If you have any questions about the MR TERRIBLE information page below please contact us. The large luxury yacht MR TERRIBLE is a motor yacht. 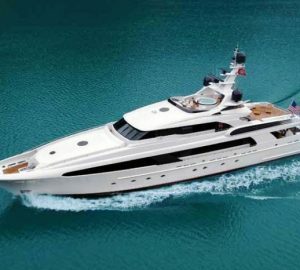 This 47 metre (154 foot) luxury yacht was developed at Delta Marine Industries in 2006. MR TERRIBLE was previously called 154001. Superyacht MR TERRIBLE is a stylish yacht that can sleep up to 12 people on board and has approximately 7 professional crew. Launched to celebration in 2006 her reasonably recent interior design promulgates the seasoned experience emanating from the boards of Delta Design Group / Espinosa. MR. TERRIBLE’s 54 ft semi-displacement design was built for high performance reaching maximum speeds of 24 knots. She is powered by twin MTU 16V4000's and carry’s 14,500 US gallons of fuel with a range of 3,500 nautical miles. Her sleek exterior has a low profile and her interior has been styled with authentic Polynesian artistry - tropical textures indigenous to Hawaii juxtaposed with finely polished modern detailing. The yacht's wider design collaboration came from Delta Design Group and Espinosa. The technical naval architect firm intellectual property are the creation of Delta Design Group. Motor Yacht MR TERRIBLE received her stylish interior designing from the interior design office of Delta Design Group / Espinosa. Created at Delta Marine Industries the vessel was built in the country of the United States. She was officially launched in Seattle Wa in 2006 before being delivered to the owner. The hull was crafted from composite. The motor yacht superstructure is fabricated predominantly from composite. With a width of 8.95 metres / 29.4 feet MR TERRIBLE has spacious size. A shallow draught of 2.29m (7.6ft) limits the list of overall harbours she can enter into, contingent on their particular depth. She had refit maintenance and alteration work undertaken in 2008. The yacht is driven by twin robust MTU main engine(s) and can accelerate to a exciting maximum limit speed at 24 knots. The engine of the yacht generates 3650 horse power (or 2722 kilowatts). Her total HP is 7310 HP and her total Kilowatts are 5444. For stabalisers she was built with Quantum Zero Speed. Regarding bow thrusters she was built with Quantum. Her animated cruise speed is 20 knots which offers a range of 2700. The large luxury yacht motor yacht MR TERRIBLE can accommodate a total of 12 guests and has 7 professional crew. 46.93 metres / 154 feet. 2700 at a speed of 14 knots. The yacht uses Aqua Air air conditioning. The luxury yacht MR TERRIBLE displayed on this page is merely informational and she is not necessarily available for yacht charter or for sale, nor is she represented or marketed in anyway by CharterWorld. This web page and the superyacht information contained herein is not contractual. All yacht specifications and informations are displayed in good faith but CharterWorld does not warrant or assume any legal liability or responsibility for the current accuracy, completeness, validity, or usefulness of any superyacht information and/or images displayed. All boat information is subject to change without prior notice and may not be current.